Human settlements are built on the bedrock of food access. Without adequate sustenance, urban environments cannot flourish. People will travel long distances to ensure that they are adequately fed, and so it’s no surprise that rural and suburban dwelling will often traverse many miles to the nearest food source. But urbanities would appear to have an especially unique advantage of food access on their side. After all, dense urban environments naturally mean an increased density of food sources and less distance between them. 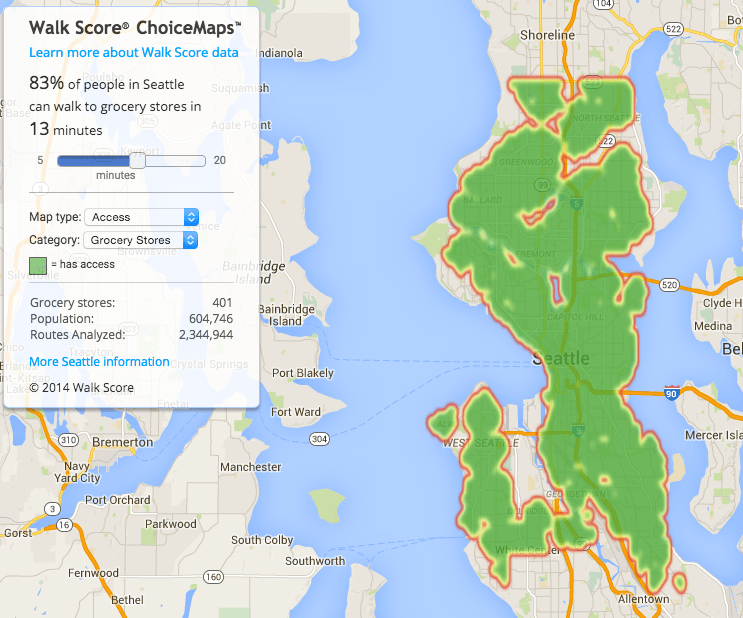 But access to food is not entirely equal in Seattle, and data from Walk Score shows it. 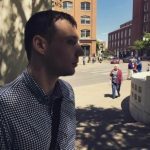 Last year, Walk Score set out to determine the access and diversity of grocery stores in major cities across the country using their walking algorithm. They wanted to see where food deserts and food havens were. Walk Score identified grocery stores by using a variety of data sources (in-house, Localeze, and Google). They also defined what their criteria would be for identifying individual grocery stores. They decided to limit their search for grocery stores by excluding convenience stores and requiring that a food store sell produce. On the face of it, that seems like fairly reasonable criteria. Convenience stores may not offer a diversity of products to truly sustain the needs for an affordable and varied diet. Yet, a grocery store that sells produce is likely to have a wider diversity of goods that range in quality. With that in mind, let’s look at what Walk Score found for Seattle food access and choice. Walk Score’s data looks at grocery stores in two differing ways: choice and access. The first of these, grocery store choice is shown as a heatmap. The greener the color, the more choice a particular area has for grocery stores while extent of the red-to-green color shows the related walkshed being analyzed. Meanwhile, the grocery store access map series depicted solely as green to the areas with access to at least one grocery store. Walk Score’s most recent data would suggest that there are 401 grocery stores within the city limits. When it comes to access, Seattle seems to score pretty well in the 10-minute and 15-minute walkshed maps below, with 70% and 87% of residents having access respectively. When it comes to choice, the 15-minute walkshed map provides more than twice as many grocery store choices for the average resident than the 10-minute walkshed map. With only 2.78 grocery stores within a 10-minute walk, the diversity of choice for the average resident seems modest. The 5-minute walkshed maps seem to be a mixed bag. On the one hand, Downtown Seattle has relatively good access and choice to grocery stores. Belltown is the shining star here in both regards. But, only 31% of Seattle residents actually have access to a grocery store within a 5-minute walk of their homes. Even worse, most residents end up with a very low ratio for grocery store choice, which stands at 0.64 grocery stores within a 5-minute walkshed. Most grocery stores are located within commercial zones that permit them. Those types of zones are not usually located along the fringes. But Delridge remains as a glaring food desert within the 15-minute walkshed. No grocery store of any kind is accessible to those on foot. On the flipside, the Rainier Valley boasts phenomenal access to grocery stores–and grocery store choice. In some ways, this comes as a surprise given that minority-majority communities are usually the primary victims of food deserts, and this map series appears to suggest otherwise. The other big detail in the 15-minute walkshed is grocery store choice. This number more than doubles over the 10-minute walkshed. 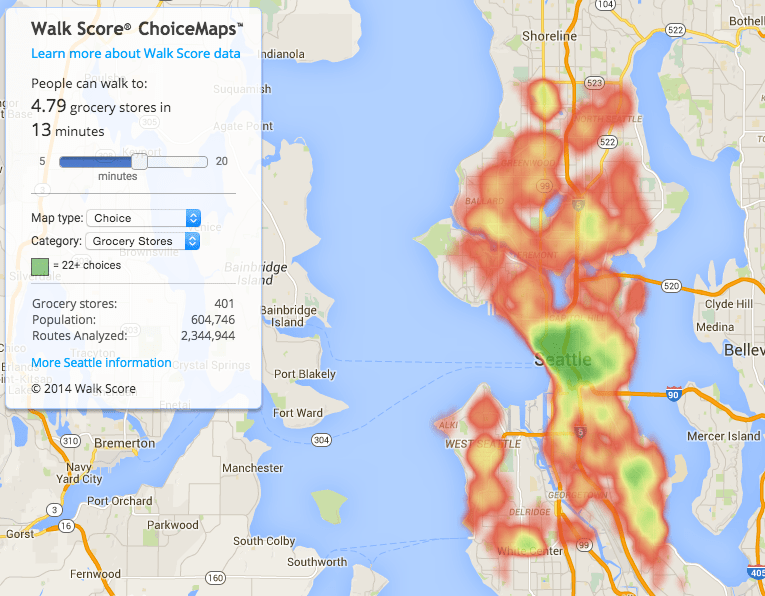 The average Seattle resident willing to walk 15 minutes is likely to find 6.29 grocery stores. Walk Score sets a 5-minute walkshed as the minimum threshold for analysis. It’s a nice, small number–and probably would be satisfying for most people. But as we can see from the 5-minute walkshed map, Seattle doesn’t deliver so well on access to grocery stores within that walkshed timeframe, and perhaps even worse in the diversity of choice. If you consider the average shopper, there is a happy medium in what they’re willing to walk. A 10-minute roundtrip walk is a breeze; that’s 5 minutes out and 5 minutes back. Most shoppers are almost certainly willing to take up a longer walk than this for their daily food needs. If I had to pick a fixed roundtrip time as a maximum, it’s probably more than 20 minutes, but less than 30. Beyond this roundtrip timeframe, people will likely pursue other options that are faster like biking, busing, or driving. Using that broad 20-to-30-minute roundtrip walk threshold, we can reasonably exclude the 15-minute walksheds as a standard for access and choice to grocery stores. It’s not clear what the magic number is, but let’s assume it’s 26 minutes for a 13-minute walkshed. The resulting data points from this aren’t markedly different from the 15-minute walkshed. In this instance, 83% of Seattle residents end up within a short of grocery store and have a choice of 4.79 grocery stores on average. Despite all of this, what we don’t know is the actual diversity or quality of grocery stores that Walk Score is counting in Seattle. There’s no way to distill down the details about the 401 stores that their database is measuring. We can assume, at worst, that their definition covers the limited offerings sold in many bodegas and corner stores, and, at best, the breadth of goods sold at Uwajimaya and Fred Meyer. It’s entirely possible that many areas that appear to have access and/or abundant choice, actually have poor offerings of food in terms of the quality, cost, and variety. At the same time, not all chain grocers–which are not identified by Walk Score–are even created equal themselves. Safeway, a large grocer in the area, run on a spectrum for store formats for size and diversity of food choices. Meanwhile, Walk Score chooses to exclude convenience stores and stores that don’t sell produce (e.g. 7-Eleven and Walgreens) in spite of the fact that they may provide important local access to basic needs of consumers. Ultimately, it’s difficult to draw absolute conclusions on what these maps mean for quality, walkable access to food sources. Regardless of these issues, it is clear that most people in Seattle still live or work within a very reasonable distance of a grocery store–even if we toss out the 15-minute walkshed maps. But in areas where choice and access are low, they present compelling cases for local growth. Because, as we know, growth and added density eventually beget important urban benefits like neighborhood food sources. Many neighborhoods would love to have the problem that Capitol Hill (land of a million QFCs) is faced with–residents there get to debate whether or not another boutique grocery store could be great addition to neighborhood’s beloved Broadway corridor. Two of our favorite specialty stores are Trader Joe’s and Costco, and those are unreachable on foot or by bus. In the real world, except in a few of the highest density zones, most people drive for groceries out of necessity. I don’t see that changing very much or very quickly. I wonder how this model might be expanded here: When I lived in Cork City, most of the local grocers would offer delivery of goods to people’s homes–for no charge. The catch was that you had to purchase €50 in goods. For the average consumer, that wasn’t difficult to do so it was normal for people to merely walk to their grocer from work, pick out their goods, and then go home. Not too long after, that food would turn up to your doorstep for delivery. I would also counter the notion of “most people drive for groceries out of necessity.” There’s hardly a rational reason for that. Instead, it’s merely a matter of choice that people do that. And, I would chalk a lot of that up to prevailing cultural desires. People are capable of walking or biking to get their goods. People all over the world and the city (Seattle) do it every day without a problem. I would also suggest that this cultural desire is actually changing. People want to be able to walk to their grocery store. Ask people one of their first considerations for where to live, and a grocery store in close proximity probably even tops “quality” public schools as a priority. Yes, grocery delivery is a great idea. Amazon and Safeway I believe are doing it now. Yes, it’s partially a cultural thing to drive to get groceries; it’s what most Americans grew up doing, in all but the densest cities. But for families who buy a lot of groceries, it’s almost a necessity due to the volume of what they buy. The workaround there of course is to buy more often so the volume to take home is smaller. But we can’t ignore the changing habits and preferences of shoppers. Trader Joe’s offers many items that can’t be found in mainstream grocery stores. A large majority of their patrons just don’t live within walking distance of a TJ’s. Grocery stores (Safeway/Albertson’s/QFC/etc.) used to be pretty interchangeable. You shopped at the nearest one, whatever the brand; less true today. I was excited about the grocery stores I didn’t know about at my new job. But heading to Google Maps it turns out a health consultant and a general contractor were each listed as grocers. So yes, be suspicious of the data sources. Agreed, Matt. The data as-is from Walk Score is a good starting point, but they could certainly afford to do some serious fine tuning. For example, I don’t necessarily think excluding convenience stores is entirely fair, but people’s individual definitions for a grocery store might only be a supermarket. Perhaps a better approach might be a Walk Score that is adaptable to expanding and limiting the scope of grocer types by the user’s preferences. The concern I’ve heard about food deserts isn’t so much a lack of food, but a lack of fresh food. Poor access to fresh fruits and vegetables can drive obesity rates. So I think only including grocery stores is a fairly good decision, as my definition of a grocery store is anything with fresh produce. That said, the convenience store near me is labeled as a grocery store. High Point needs a supermarket. It appears to be the biggest hole in the map.